Singapore—Even national servicemen (NSF) who aren’t normally assigned to combat roles will have an opportunity to train with rifles using a shooting simulator. 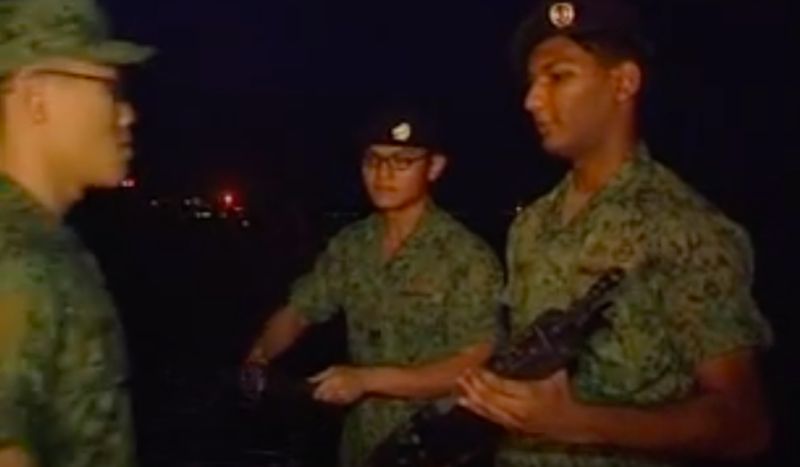 Since October 2018, both PES E and PES C soldiers have been undergoing training at the Basic Military Training Centre (BMTC) School Five at Kranji Camp. PES stands for Physical Employment Standards. NSFs who are graded PES E are usually assigned as admin support assistants or supply assistants. But they too will be able to experience the feel of using the kind of rifles that ordinary Singaporean soldiers use, the SAR-21, through the Individual Marksmanship Trainer used in a virtual firing range indoors. The trainees received a visit from Heng Chee How, Senior Minister of State for Defence, on Monday, March 18, who told the media that training safety is “front and foremost in the entire design of the curriculum.” He also said that the recruits’ parents he had spoken to were “confident and reassured”. A PES C soldier is one that is ready for combat service support vocations and some combat support vocations, while PES E soldiers can only join combat service support and service vocations. In the newly-implemented curriculum, a weapon presentation ceremony and a combined graduation parade are prescribed to both types of soldiers (PES C and E), similar to soldiers who are ready for combat. This change is new to BMTC School Five, whose curriculum is geared toward giving recruits shared defining moments. BMT is made up of four weeks of basic soldiering, and then five weeks vocation specialisation. PES C soldiers, in the past, used to undergo basic soldiering phase, and PES E soldiers had a military assimilation programme which lasted for two weeks. This was followed by vocational training, before active service. LTC Sim is the commanding officer of BMTC School Five. He also talked about another innovation to the NSF curriculum, which is the Service-Fit Fitness Programme. This is a self-regulated physical training programme, allowing recruits to undergo training at their own pace. This programme has become customizable so that recruits can train progressively and safely. He added, “The commanders that are with us right now are well-trained by SAF counselling centres so they are able to better manage the recruits. There have been three batches of recruits who have graduated from BMTC School Five thus far. Seven more batches are expected to complete the courses by the end of 2019.